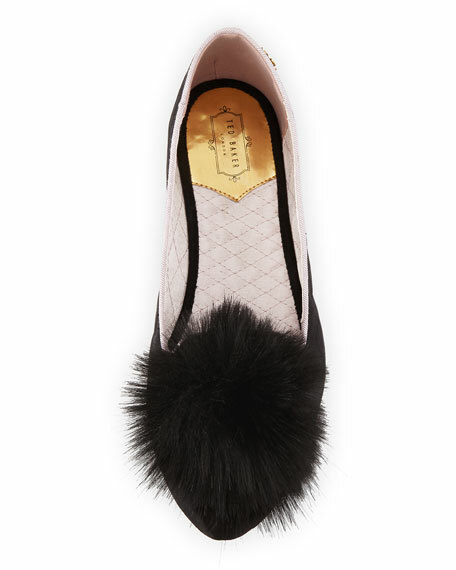 Ted Baker London "Iveye" slipper in diamond-quilted satin with faux-fur (polyester) pom-pom. 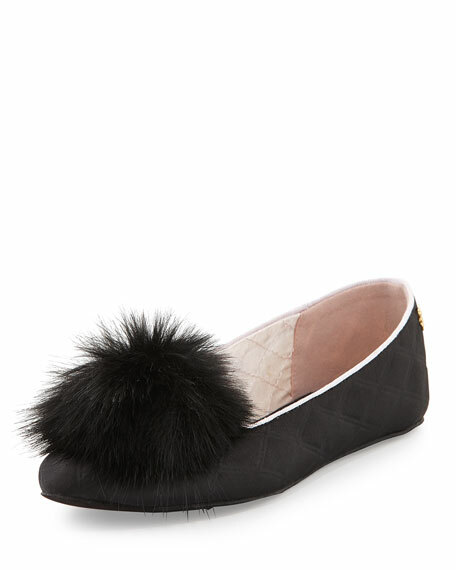 Round toe; notched Venetian vamp. Metal logo charm at heel counter. Ted Baker started out as a reputable menswear line in Glasgow in 1987, offering laundry service for every shirt purchased, quickly giving the brand the title of "No Ordinary Designer Label." Since then the line founded by Ray Kelvin expanded into womenswear with his personality at the heart of each design. Whether a quirky bow tie or a whimsical printed sheath dress draws you in, Kelvin dedicates the Ted Baker London brand to quality and detail while sharing his humor through impeccably tailored apparel.